So, let’s say you’re in a situation where you don’t have roaming profiles or you just got a new PC and don’t feel like recreating all your Outlook settings. There is a simple way of doing this. 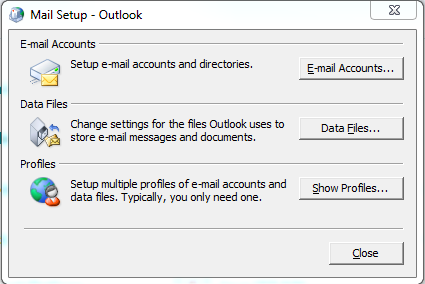 NOTE: You can also use these steps to just simply backup your Microsoft Outlook profile and settings. Click on Start and then Run and enter ‘Regedit’ and press enter. Save the .REG file to a external drive or a network path (whichever you prefer). Start Outlook to confirm everything is OK. If you feel like something was not imported incorrectly or there was an issue simply delete the new profile created in the registry or open up ‘Mail’ in the ‘Windows Control Panel’. Note: If you have multiple profiles on the original PC they will all transfer. You can delete the rest individually by going to Mail in the Control Panel. This entry was posted in Technology and tagged 2007, 2010, backup outlook profile settings, move, new pc, Outlook, profile, transfer, transfer profile on July 15, 2013 by Patrick. 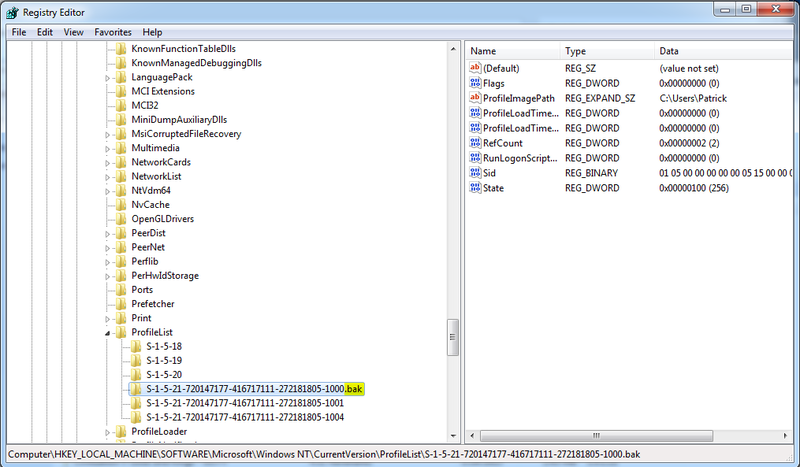 Recreating a corrupt Windows 7 profile isn’t as simple as some may think. There are a few simple steps you need to take to do so. Restart your PC to release the locks on your profiles. Log on with another administrative account. Delete any Temp Profiles that may have been created during your first attempt at recreating the profile. (C:\Users\TEMP\). “HKEY_LOCAL_MACHINE\SOFTWARE\Microsoft\WindowsNT\CurrentVersion\ProfileList”. Check the value “ProfileImagePath” to make sure you pick your own profile. I like to add a ‘.bak’ to the key in the registry. Restart and now log in with the account you were trying to recreate. This entry was posted in Technology and tagged how, how to, login error, profile, recreate, recreate profile, temp, to, Windows 7 on July 11, 2013 by Patrick.